It's killing me that Tuesdays are my day for music AND Top Ten Tuesday. I love this book-related link-up and I keep getting stuck blogging twice in one day, but I just can't help it! I might start combining the two to save time. 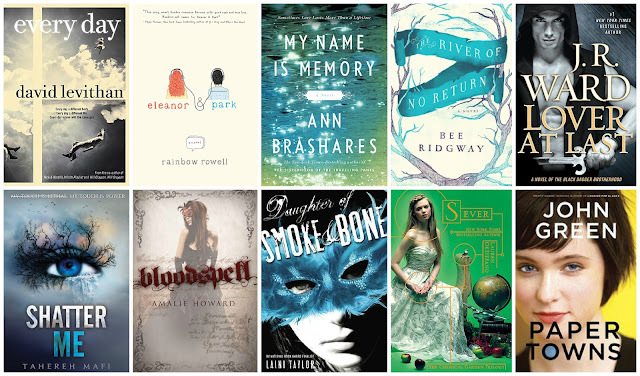 Anyway, this week's Top Ten is all about Spring TBR lists! I have a LONG list of books to be read this spring. Some are books I just want to read. Some are books I want to review. And some are books that are on my shelf and usually the most neglected. I have such a hard time balancing the three. I've decided to try and alternate between the three. One I want, one I review, one I own...then over again. How do you balance your TBR list? If you do reviews, how do you find time to read books that you just want to read? There's my list. What's on your TBR list this spring? THE BOOK CHAT TOPIC THIS WEEK IS FAVORITE SETTING! Oh I just downloaded Every Day, it's up there on my to be read list! I'm currently reading Game of Thrones. Still chugging along! I actually went to a book signing for Eleanor and Park a couple weeks ago, but then I left for vacation and didn't want to take the signed copy to the beach, so I am hoping to start it soon. I am insanely excited for Lover At Last. I haven't wanted two characters to have their moment in a long time. I'm going to add some of these to my reading list - thanks! Also, did you get a new header for your blog? I love it! I am anxious to hear what you think of some of these. I have Poisonwood Bible, The Red Tent and The Autobiography of Yogi coming up next. Such good picks. Daughter of Smoke and Bone was one of my favorite reads last year for sure! Let me know what you think of My Name is Memory. I'm intrigued!